I worked on my Horai scarf over the weekend and it's moving along very quickly. I feel like I've gotten into the rhythm with it (which I never really did the first time I tried to knit this), and between understanding the stitches and the needles being perfect for this project, it's knitting up nicely. I love the soft, fluffiness of this project! There's a tiny part of me that thinks this would make a lovely blanket if it was wider. 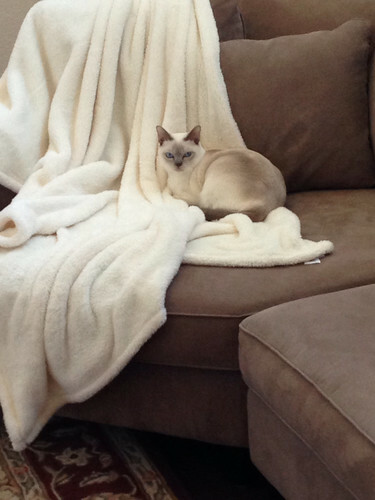 That tiny part has no idea of the cost of the blanket, but it would be warm and cozy and light as a cloud. I believe my favorite chew toy Logan has already shared our big, family homeschooling news with you. I think it's time that I clear up a few things. This is the third week that Caleb has been home schooled and I have decided to take a more active role in it. The first week, I noticed that he was hanging around during the day and I just ignored it, hoping things would go back to the way they were. The second week I started paying attention. I mean, if things like this are going to happen during your naptime in your own home, you need to make sure the humans are doing it right. After all, if Caleb isn't taught properly, it could affect his whole life. I have plans for his bedroom. That boy is going to college! Anyway, last week I paid attention to what Mommy was teaching him. I also assessed his current skill set to determine what he needs to know to be able to survive as an adult. This week, I have taken part in the homeschooling every day. I have determined that he is not yet ready to go out into the world on his own. 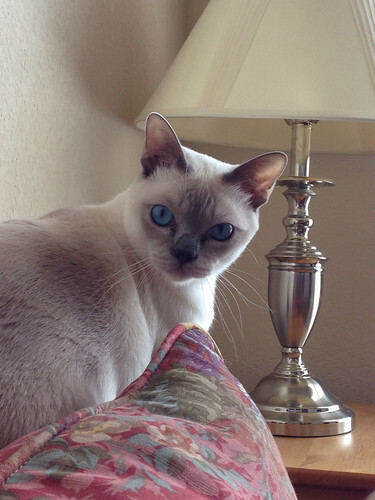 His hunting skills are sadly lacking, I mean I don't think this boy could catch and eat a three legged grasshopper. I have yet to see him take a proper tongue bath, and I've been part of this family for almost two years. (Don't you humans know anything about hygiene?) His leaping skills are absolutely non existent. There is no way this kid could get from the kitchen counter to the top of the refrigerator in a single bound, and definitely not before Mommy yells at him for standing on the kitchen counter. 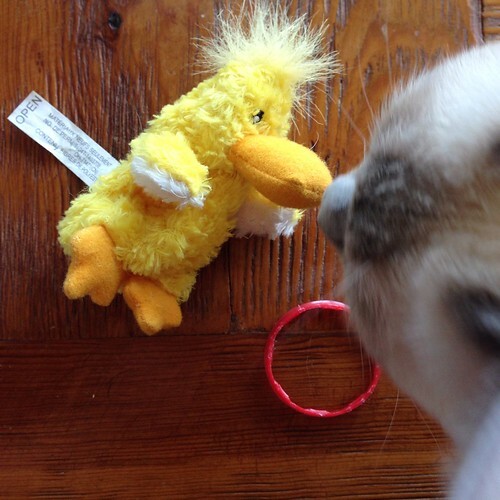 It is clear to me, that if he is to survive in the wild, he will need to learn additional skills from me - cat skills. So this week, every day, as Mommy "teaches" him, I educate him. During math, when he is typing his answers into the computer, I walk across the keyboard and track pad. This will sharpen his reflexes and force him to become quicker. Khan Academy might make him work on multiplying with decimals, but I'm teaching him life skills here. When Mommy gives him spelling and vocabulary words, I knock them off the table and run off with some of them, or do I? I'm speeding up his reaction time and prey response times. Carnivore - there's a vocabulary word for you! When they work on English, I don't have to assist that much, but then they are both good at making up sentences about me and how wonderful I am. I really can't improve upon that too much. (But I'll give kitty bonus points if you can find the prepositional phrase and skeleton of the previous sentence.) Writing assignments are also interesting to me. First of all, they involve pencils (I love to steal pencils) and second, Caleb wrote about birds last week. I'm hoping he writes about me this week, but I could accept an ode to bacon as well. By the time they get to History in mid afternoon, I'm pretty tired. After all, I've been teaching Caleb since morning at this point. Fortunately, History involves a lot of reading. Reading means Caleb wants to curl up with a blanket. I'm training him to curl into cat approved positions so that I can crawl under the blanket and take a nap. I don't mind how many books he uses or how many notes he takes as long as he sits still so my nap isn't disturbed. I overheard them discussing some ancient culture with a cat goddess or something the other day - I'll have to get some more details on that one. There are other subjects that Mommy is teaching him and I'm beginning to think Mommy is doing some of them after I fall asleep, on purpose. Unfortunately, sharing the immense amount of knowledge I possess is exhausting and I have to sleep sometimes. I know sometimes it's frustrating to Mommy that I know so much while she is blathering on about silly things like "Scientific Method," but I know that she's also impressed that I care this much about Caleb's future to ensure he has the tools he needs to move out so I can turn his room into the kitty paradise it was meant to be grow into a responsible, thinking adult. That is why yesterday, during lunch, I demonstrated the proper four legged disemboweling method on a napkin. 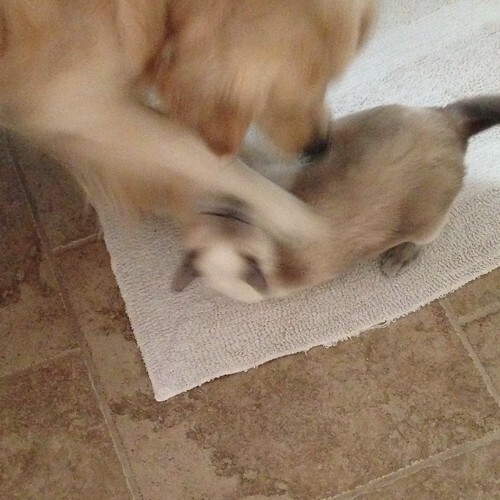 You know the one, front legs wrapped around the prey to restrain it, back legs kicking rapidly with claws extended, really a nice evisceration technique for everyone to know, perfect for any social occasion. Let me tell you, that napkin won't be causing any more trouble around here! Thanks to my quick thinking and selfless nature, Caleb's education will also be saved and he will grow to become a good and wise man. In his own house. Is It A New Project Or A Restart? Back in January of 2012, I started knitting Horai. I used the wrong cast on, I couldn't get a handle on the stitch pattern (counting to four is not as easy as it sounds), and I hated my needle selections. 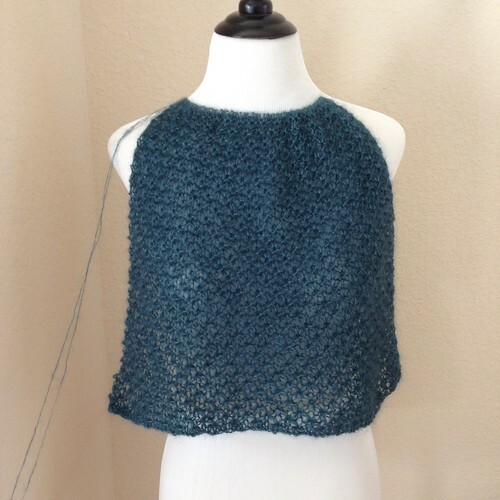 The yarn was Shibui Knits Silk Cloud in Fjord, a gorgeous, dark blue green color and you knit it double stranded. Yes, you read that right - double stranded, fine and fluffy. My metal needles were too heavy and would drop right out of the stitches if I wasn't careful, my bamboo needles were way too blunt to work the Horai Stitch, and my wooden needles (the Knit Picks) were too dark to see the yarn easily and the taper of the tip didn't work well for the Horai Stitch either. All of the issues I was having meant I stopped knitting it, frogged the yarn (yes, I frogged mohair, do I get a medal?) and put it away until I got better needles. Monday night I got the better needles! Yesterday I cast on for Horai again. I used a long tail cast on this time and I've got a good, stable edge. I know how to count to four now and the stitch pattern is going perfectly. But the best part of the whole thing is the needles. 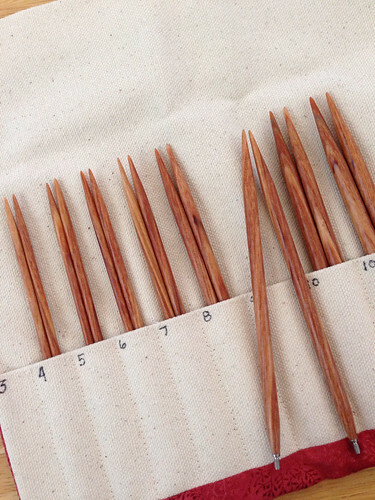 My new Chestnut needles are light enough to see the yarn - both strands of it, the lace tips have a long taper with a sharp tip and the Horai Stitch is a piece of cake, and the joins - where the needle tips meet the cable - they're perfect! This project is so much nicer to knit this time around. I've only gone a few inches but I can tell that things are much easier and I hope to have a finished wrap at some point in the future! My new needles arrived late yesterday evening. 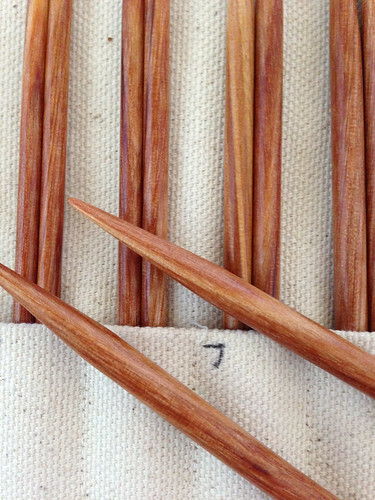 These are a large, 5 inch set of lace tips in Chestnut from Dyakcraft again. This order took less than 8 months! When I decided that Rosewoods would be my first set, I knew I'd need a lighter color as well, because the idea of knitting dark yarn on the dark Rosewoods just doesn't seem like a good one. There are several light or striped wood tones available in the Darn Pretties, but I decided to go with Chestnut, the most solid of the light woods. As you can see though, it's not a washed out, flat, pale wood color, it has some depth to it. It reminds me of honey, but with red tones instead of golden yellow tones. Maybe that makes sense, or not, but by now you're all used to me, so you probably get it. I know exactly what I'm going to cast on with them, and I hope to cast it on today! You'll have to wait and see what it is! Sheep tushie! (And a fox tail.) Caleb chose the fox for himself. 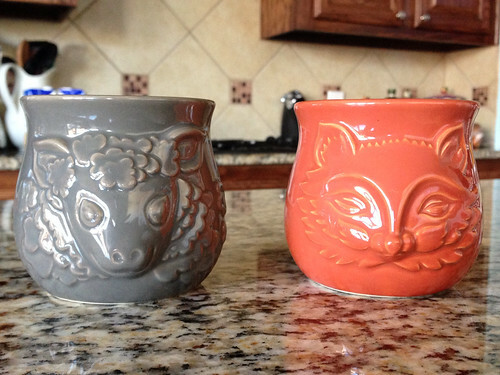 They have candles in them, but I figure once we've burned down the candle, we'll have cute little bowls or cups for stuff. And did I mention the sheep tushie? Yes, I'm easily amused. Unfortunately, I don't love the yarn in garter stitch. 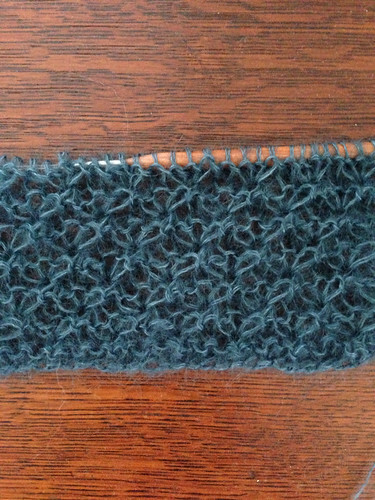 Something about this yarn and garter stitch just doesn't work. I don't think changing needle size will do it, I just don't like the feel or the look. 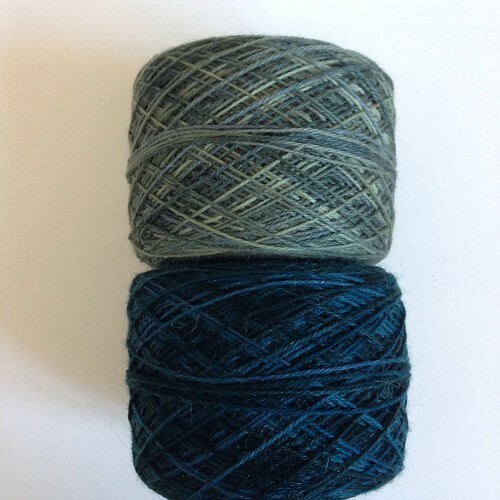 Also, I read some comments on the yarn (turns out I'm not the only one who doesn't like this in garter stitch) and lots of people had issues with color bleeding. That's not what you want to hear on a two color shawl. The more I think about it, the more I think I'll be happier using the yarns in separate projects for non-garter stitch shawls. I didn't feel like plowing through my patterns last night and picking another one, so basically what I'm showing you this morning is nothing. On the other hand, I did get a shipping email late Friday, apparently I have another set of Darn Pretties (the needles) on the way and it should get here today! These are probably my Chestnut set. I'll show them to you tomorrow if the Post Office comes through! Yesterday afternoon I finished knitting the body of Milano! I was so happy to have the blue greens end up near my face. I started weaving in ends last night and when that's finished, the neckline gets an i-cord edging before the body section is completely finished, but I'm calling the body done anyway. I'll be starting sleeves sometime this weekend! 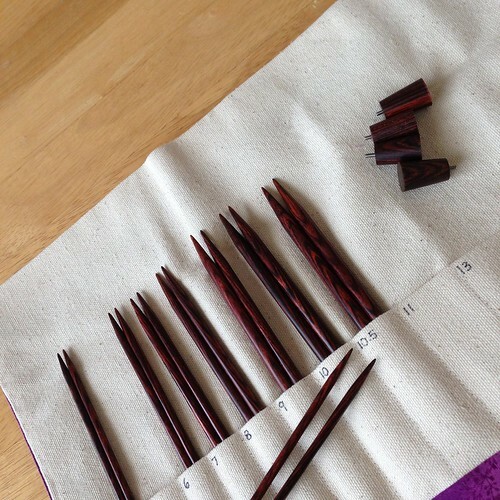 Yesterday my first set of Darn Pretty Interchangeable needles arrived! I ordered these on January 1 of this year, so it was only an 8-1/2 month wait! For those of you who are wondering why on earth anyone would wait that long for needles, I'll fill you in. Darn Pretties are made by Dyakcraft here in the US, Vermont actually, by Tom and Linda Diak. 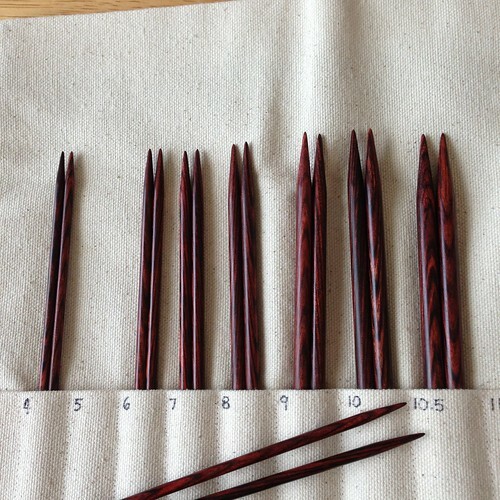 The needles are hand turned, hand finished and hand assembled. A few years ago, the wait was only 2-3 months from placing the order to completion. Then the Yarn Harlot mentioned how great they were. She has such a huge audience that all of a sudden the Diaks were swamped with orders. Almost overnight, the wait time jumped to well over a year. The Diaks hired more people and they bought more lathes. Of course, until early this year, they were also letting customers choose their own mixes if they wanted more than one wood color in their sets. There's still a long wait, but they are getting faster, and if you want to knit on gorgeous handmade needles, it's worth the wait. I knew I wanted some, but I know I need more than one set, so I hemmed and hawed about it, trying to decide what to order. (Originally, I was going to put everything into a single order.) Then I decided to just start ordering and then as things were ready, they'd start shipping. 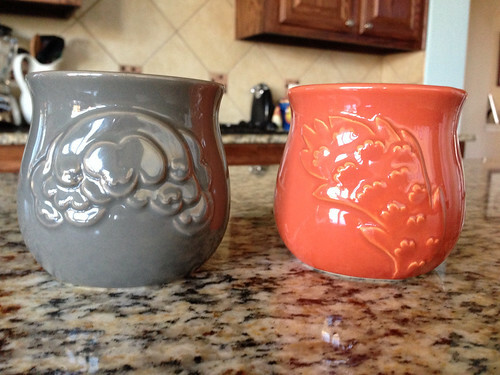 So, here are my first Darn Pretties! 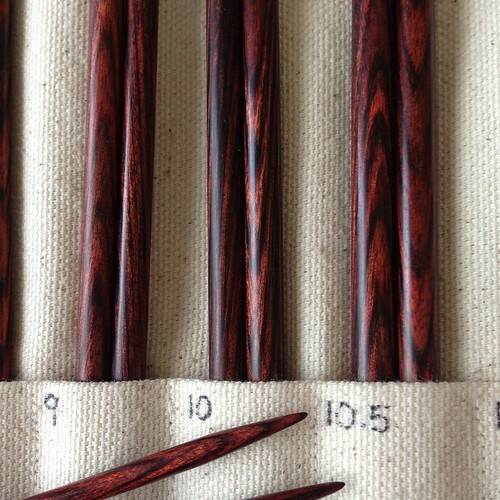 This is a large (4-10.5) set of 5 inch tips with regular points in Rosewood. I'm so happy with them and can't wait to cast on a new project. If I switch over to them on any projects in progress, I'll have to make a new gauge swatch. Different needle materials will give you different tension even if the needle size is the same. I don't want to knit a new gauge swatch, so for a little while at least, I'll just unroll them and look at them while I knit. Mommy let me blog today so I can share our big news! Oh, it is so exciting! Want to know what it is? Caleb is being homeschooled now! I think Mommy and Daddy realized how much I hate riding in the car and how even though I was doing better than I was a year ago, I still really didn't like driving Caleb to school every morning. Oh, Mommy says the decision has nothing to do with me. Well, whatever reasons they have, I love it! They started last week and I have already learned so much! I've learned that I have to wait for free reading time to snuggle up with Caleb, but once free reading starts, he and I can make a nest together. I've learned that History books taste good but Mommy says they don't need kisses. I've learned to sleep through math. (I can only count to three because that's how many scoops of food I get - if they'd give me more scoops, I could probably count higher.) Also, I'm not very interested in science, but Mommy says that will be getting more interesting. We haven't started Logic yet, but when we do I know I'll do a great job with that - Golden Retrievers are known for being logical! English and Grammar are much more interesting with big, thumpy, tail wags, and for PE, I get to run with Caleb and Mommy! Max is participating too, but he's mostly biting on the binders. (Like the History books that don't need kisses, the binders don't need biting either.) He also likes to sit on Caleb's papers so they don't blow away. I'm not sure why Max is allowed to come to homeschool, but maybe it will make him a better kitty, and he'll stop biting things (like me). We do get to practice our wrestling, on the bathmat, every night. I guess that's PE for Max since he can't go for a run with us. It's all very exciting and Mommy and Daddy and Caleb seem to really be enjoying it along with me. I'm so glad they decided to homeschool me! (Mommy says that wasn't the plan either - silly Mommy.) She says that sometimes she has to study things so she can teach them to Caleb (and me), and she can't spend as much time knitting, but she says things will be settling down some too as everyone figures out a system and we get into a rhythm around here. I'm just happy to be part of it! I'll let you know more details later, but I think I spotted the Ancient History text in the other room and it's unattended - it clearly needs kisses! 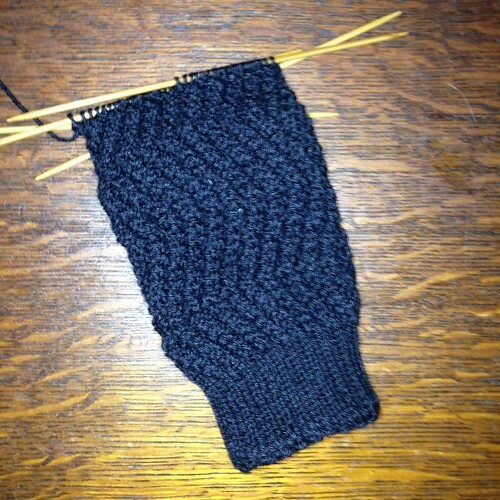 I'm more than halfway through with the leg of the second, manly, black sock. I have found that working on it during the day makes a difference in mistakes, dropped stitches and split stitches that I don't catch until later, when I'm working on it again in better light. It's much less frustrating to work on it in daylight, so that's what I'm planning to do. I'm so glad this is the second of the manly, black socks. 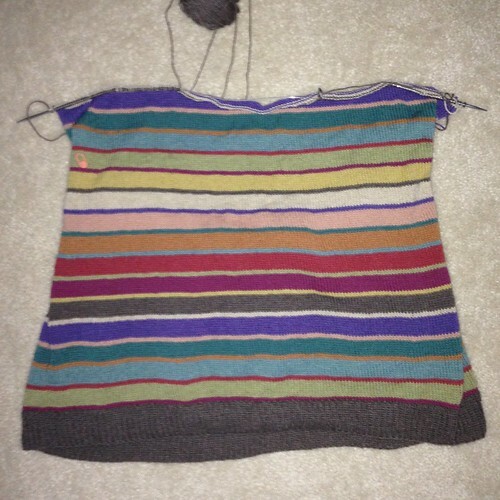 I got a lot of work done on my stripy sweater over the weekend! Do you see that little peach stitch marker on the top left side? That's where I divided the back from the front. If you'll look up at the very top, I've started neck shaping for the back. This sweater has a funny shape, but I have a store bought one like this: big and boxy in the body with narrow, fitted sleeves, and it looks great being worn. Something about the huge, oversized fit in a drapey fabric and it actually looks flattering. 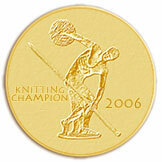 Of course, I've still got to weave in about eleventy million ends, but I will - eventually. 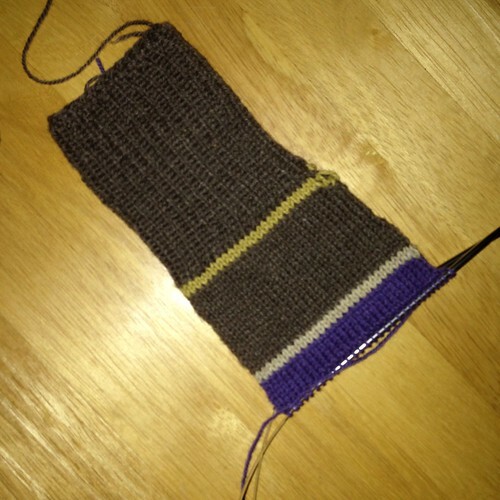 I have gotten a little bit done on the second black sock - but not very much. Unfortunately, Flickr is down this morning, so I can't post the picture. You'll just have to use your imagination. There's still a long way to go. There has been a lot going on around here this past week (and I'm not ready to blog about it just yet) and it's affecting my knitting time some. I'm hopeful that things will even out in the next couple of weeks, but until then, there may or may not be knitting to share. Max and Logan have volunteered to help fill in the gaps in the meantime. I don't think you'll mind. I'm striping right along! This sweater is zipping along faster than I thought I would. I figured it would take a while to knit since it's knit in fine yarn and it's hugely oversized in the body. Maybe it's the stripes that are amusing me and keeping me going. Whatever it is, I'm feeling pretty confident that I'll have this ready to wear when the weather turns cool enough to wear it. Also, I just love the colors! Yum! 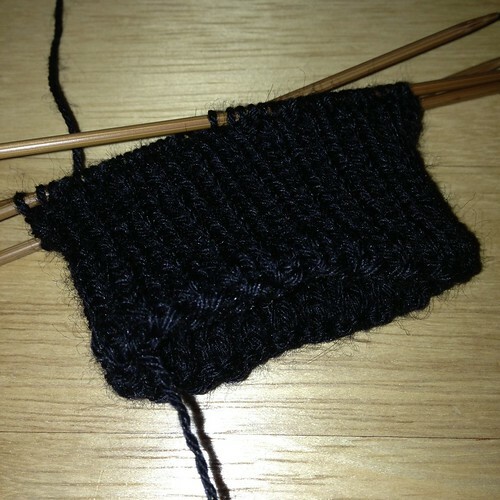 I've started the second black sock. I've already dropped a stitch and had to go find it. So. Much. Fun. I love working with tiny black yarn! At night. If I was smart, I would knit this during the day, by the window and work on other things at night. You cannot imagine how much I wish I was through with this pair of socks. I just want it done! Unfortunately, whining about it on the Internet won't get it finished. The Magic Knitting Nighttime Elves haven't shown up and finished it while I sleep either. I guess I'll just have to get it knit and try not to drop any more stitches. I love stripes. There are so many things you can do with them. There are so many ways to mix colors with them. They're just fun. With knitting though, there's a little problem with them. Every time you change colors you have two ends: the end of the first color and the beginning of the second color. 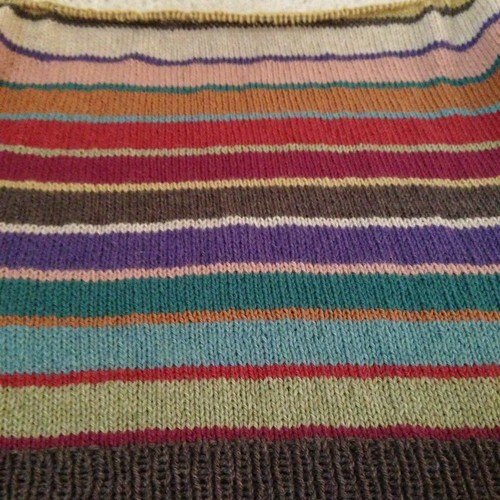 If you have a lot of stripes (like my current pullover), they can get out of hand pretty quickly. In the case of my pullover, I have the added problem of jogs. When you knit back and forth, each row sits nicely on top of the last one. 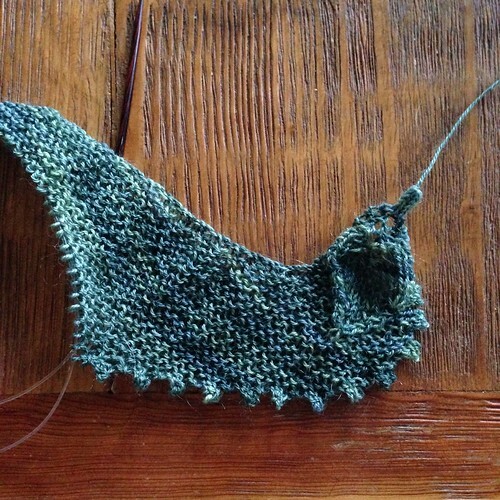 When you knit in the round, you aren't knitting rows, you're knitting one long spiral. This means that at the end of the round when you change colors, the stripe doesn't end smoothly, it makes what's called a jog. You can see it in the picture below in the upper stripes that haven't had their ends woven in. The lower stripes have had their ends woven in and by weaving in carefully, I can essentially correct the jog. 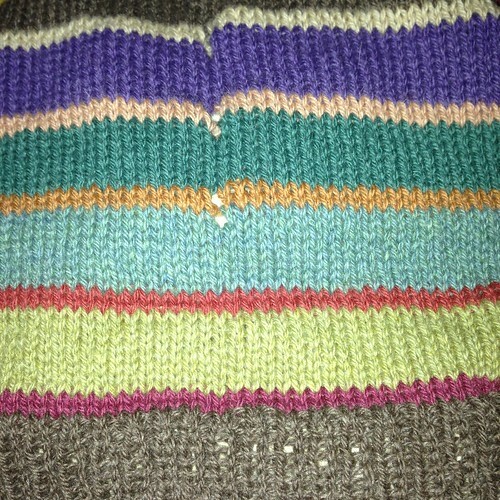 I'm using the directions written by the designer for weaving in ends and making the stripes sit right. When I weave in the ends, I duplicate stitch (from the backside) only on the color I'm weaving in and that helps adjust the jog. It's not hard to do, it just takes a little bit of time, and flipping back and forth to the front to make sure I've got the tension right. 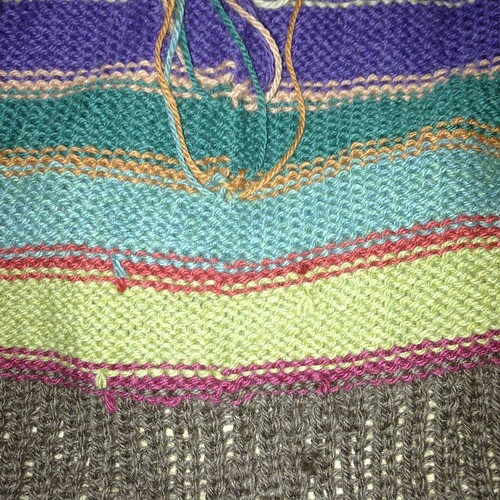 When I'm all done, I know it will be worth it because I'll have perfect stripes - lots of them! I finally finished the first sock for Mickael (not that he's needed them this summer or anything). I really like the way the finished sock looks and I think the pattern is easy and interesting to knit, but I'll be glad when I get the pair finished - knitting black socks isn't fun. 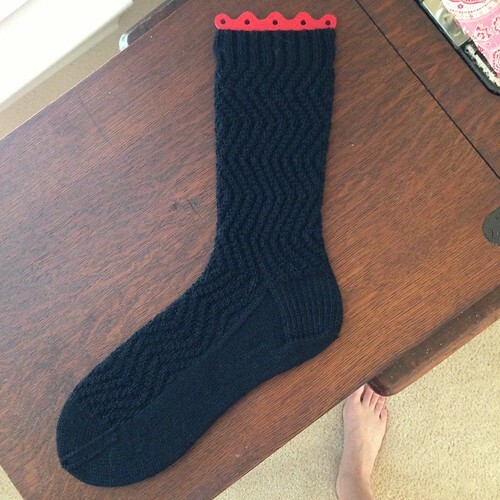 Other than Mickael, there's only one other person on Earth I'd knit black socks for and that's Caleb, and he has to wait until his feet stop growing before I knit him black socks. I just noticed that my foot snuck into the picture this morning, sorry about that! Oh, and since it's been months since I talked about this sock, the pattern is Go With The Flow and it's free. The yarn is Berroco's Ultra Alpaca Fine in Black (obviously). I've got a pale pink sock yarn in the stash, and I might actually knit myself a pair of these in that. At least I'll be able to see what I'm doing in the pale pink! I did some striping over the weekend! 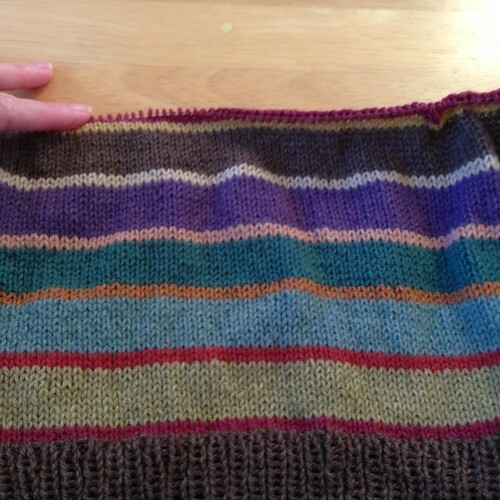 I've now used all eleven colors at least once (Earth has been used twice - the ribbing and a stripe). The very first small stripe above the ribbing is Berry, and up at the top, on the needles is part of the first Berry wide stripe. The colors stay in the order above for the rest of the body, but since there are an odd number of colors, if they were wide the first time around, they'll be narrow the next time. It's kind of neat the way that works out. Or at least it is to me, but I'm easily amused and uncaffeinated. Just work with me here. There was a question in the comments over the weekend about how I was going to deal with the ends since lots of colors mean lots of ends. 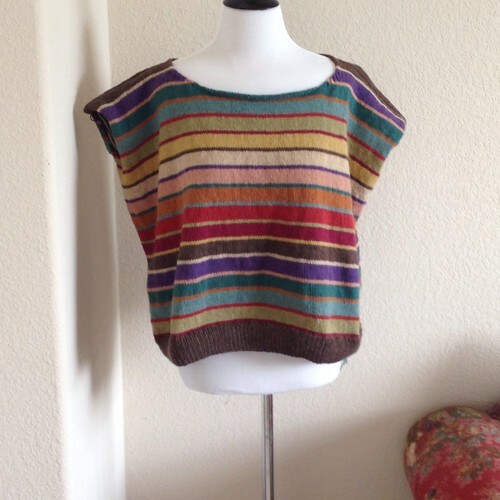 The pattern makes a reference to this blog post by the designer where she explains how to weave in ends and correct for the jog at the same time. I used this technique on my last sweater and it works great. The only thing different I do is that I don't use a slip knot as a temporary join between the old color and the new color. I just let the ends hang. When I go back to weave the ends in, I have to double check the tension anyway, so I just take care of any looseness then. I haven't woven in any of the ends on this sweater yet, but I'm going to be working on them soon. Next time I blog this sweater, I'll get a shot of the inside with some ends woven in.